How good are you at at knowing names of songs? From all eras? From many genres? Here's your chance to prove your music IQ! 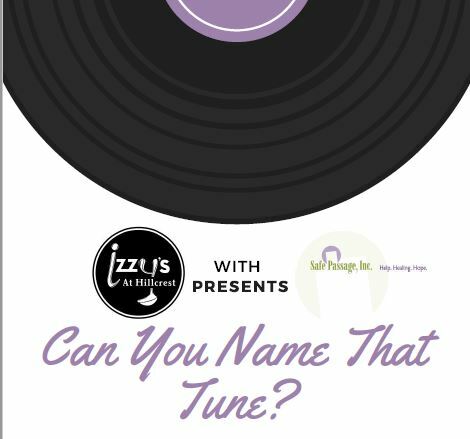 On Saturday, April 13 Izzy's Restaurant in Batesville will host a customized Name That Tune music game for Safe Passage. The $25 ticket not only gets you into the game but also allows you to feast on a great pasta bar by Izzy's. Reservations are needed by April 6, and tables/teams of up to 6 can compete together. If you don't fill a table, you may be teamed with another small group. Dinner begins at 6:30 with the game following about an hour later. "It's going to be so much fun! Even if you're not the best at naming songs, you can rely on team or tablemates to fill gaps. We're thrilled the management at Izzy's is community-minded and hosting this for Safe Passage," said Mary Mattingly, Outreach Director. The proceeds from ticket sales, signature drinks, split the pot and $5 song clues will all benefit the victims of domestic and sexual violence whom Safe Passage serves. Live music (guitar or piano) plus recorded music will trade off playing so many seconds of each song. The final round will pit the two teams with the most points and they'll have to name the tune in so many notes/seconds, just like the old TV show format. Prizes will be handed out to the winning team, but the biggest reward is bragging rights! You rule the jukebox! Contact Izzy's at 812 932-4999 to RSVP. Space is limited!